This species is common in various fishes in India, including the type host Anabas testudineus from freshwater swamps (Soota, 1984; De, 1993). Invasion of fish occurs in spring and summer and they grow in the fish during the monsoon and autumn. The proportion of males in the worm population increases in the early autumnal period and then decreases rapidly after they have fertilized the females. Larvae are released from females in late winter and early spring. Campana-Rouget et al. (1976) reported that C. cotti (syn. C. fotedari Raina and Dhar, 1972) of Asian origin was established in aquarium guppies (Lebistes reticulatus and Danio rero) in France. The parasite developed in Cyclops sp. Guppies fed infected copepods had adult worms 10 weeks later. Since the early observations of Metchnikoff (1866) and Leuckart (1876) there have been additional studies of C. lacustris, notably by Kupriyanova (1954), Campana-Rouget (1961) and Moravec (1969, 1971a,b). This parasite is common in predatory European fishes of the Percidae, Salmonidae, Gadidae and perhaps Esocidae and Siluridae (Moravec, 1971a). First-stage larvae are 440-580 mm in length and develop to the infective third stage (660-880 mm) in the cyclopoid copepods Megacyclops viridis, Macrocyclops albidus, Acanthocyclops vernalis, Mesocyclops leuckarti, Eucyclops serrulatus and Cyclops strenuus (see Moravec, 1969). Larvae from the copepods reached the adult stage in 91 days in Perca fluviatilis, the fourth moult of the males occurring 35 days and of the females 67 days postinfection. Chandra and Chubb (1992) reported that first-stage larvae survival was related to temperature. Larvae survived 69 days at 5°C and 28 days at 20°C. The ability to invade copepod was lost after 7 days at 5°C, but was retained for 23 days at 20°C. 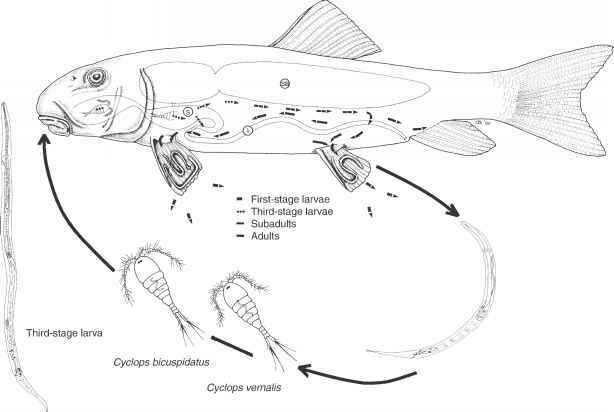 Moravec (1971a) noted that larvae from copepods developed to the adult stage in various predatory fishes whereas larvae remained in the third stage in non-predatory Cyprinidae and Cobitidae, which evidently serve as paratenic hosts. In Leuciscus cephalus, a predatory cyprinid, the parasite developed to the adult stage but more slowly than in other predatory fish such as P. fluviatilis. postinfection at 25°C and the second on day 6. The stout infective larva (450-671 mm in size) was orange in colour and had a well-developed buccal capsule and three well-defined mucrons on the tip of the tail; it lay coiled and inactive in the haemocoel. In the fish host, the third moult occurred 9-10 days postinfection. The males underwent the fourth moult 17-18 days and the females 24 days postinfection. Mucrons, found in both the third and fourth stages, were lost at the final moult. Small forage fishes like spot-fin shiner (Notropis spilopterus), emerald shiner (N. atherinoides), smelt (Osmerus mordax), freshwater drum (Aplodinotusgrunniens) and alewife (Alosapseudoharengus) harboured larvae and even adult worms, which could be transferred to piscivorous fish such as white bass (Morone chrysops), yellow perch (Perca favescens) and smallmouth bass (Micropterus dolomieui). 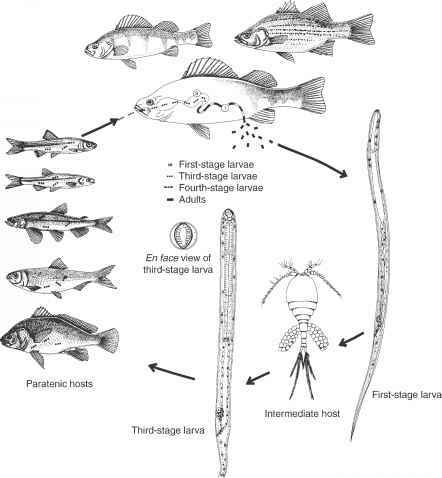 In some forage fishes, the worms occurred in the intestine but encapsulated fourth-stage larvae were also found on the mesentery of freshwater drum and were infective to bass. C. oxycephalus occurred in all size groups of white bass in Lake Erie but prevalence and intensity were higher in larger fish (91%) than in smaller fish (72-86%). During July and August most worms in white bass were in the third and fourth stages. This indicated that adults die in summer during or after the release of larvae and fish acquire new infections during the same general period. This new population of worms remained arrested in fish over winter and only matured in spring, when cyclopoid copepods were most abundant.